The Nissan Caravan is a van designed by Nissan for use as a fleet vehicle or cargo van. Outside Japan the car was sold as either Nissan Urvan or Homy. Several configurations of this van are available, including the GX (flat roof) and DX (taller roof) models, and several models with multiple engine configurations including the KA24DE, the KA20DE I4, a 2.7 liter TD27 I4 diesel, and a 3 liter diesel, the ZD30DD I4, as well as the ZD30DDTi I4. The E25 chassis is also used in connection with the Isuzu Como with same engines offered by Nissan. From 1986 until 1987, a KD-ARE24 chassis was used. The 1988 to 1997 models used the E24 chassis, models from 1998 onward use the TA-QGE25 chassis and VWE25 chassis. 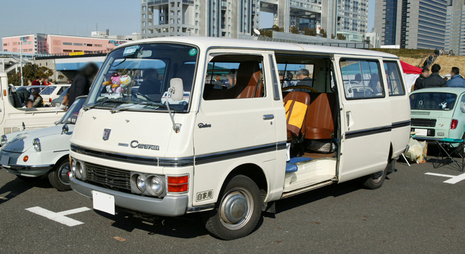 Currently, the Caravan outsells the Toyota Hiace since 2004. One main reason is due it having more power and cargo room. 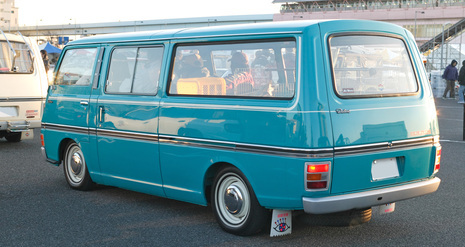 The Urvan was a transporter vehicle manufactured by Datsun with 3, 5, 7 and up to 10 seats (minibus). It was especially popular in Europe, and was again very popular in Fire Departments and as ambulances in certain countries. It had a somewhat difficult handling, as it was heavy to steer, and did not come with power steering. Also, the gear shifter was located at the floor and went all the way up to the height of the hand, and had a slight curve. The gear shifter was nearly 80 centimetres long, so it was somewhat clumsy to shift, but it came with 5 gears, unusual in Europe at that time. It was delivered with a 1.6 litre (1596 cc) engine, a 1.8 litre (1798 cc) engine and a 2.0 litre (1998 cc) engine. It was produced from 1978 to 1983, when the Datsun brand ceased. The Urvan was rebadged as a Nissan in 1984. The Urvan was used in a Norwegian Olsenbanden movie from 1982. It belonged to "KBG", meaning "Kristoffersen Body Guards", a pun on KGB. CARAVAN restyled after an interval of 15 years in April of 2001. Driver's comfort not to mention the enhancement of the economy in the work use and the functionality and the livability are improved, and it has high collision safety. "SILK ROAD" of getting on of 8 people will newly join the lineup in the minor change in May, 2003 in November of the same year though "COACH 10seat" that the large number of people getting on is possible was added. The practicality that can load luggage enough even if 8 people get on is made to be united to the ride comfort. For outdoor use, Cabronshet that can easily wipe dirt and the water getting wet off is adopted in all seats. In addition, a variegated seat like the 2n seat that can separately do the back and forth slide by dividing right and left and 3rd seat with chip up function are set. The goodness of convenience by lugegge floor water-repellent processed cannot be overlooked. The best spaciousness for leisure together with the both sides slide door was achieved. Engines are straight4 DOHC of 2.4L, and it is combined with column shift 4speed AT. Basic safety equipment such as SRS air bags and ABS is all-car standards. The function equipment was enhanced considering convenience as the feeling of quality improvement of the interior was aimed at centering on a senior grade besides the design around the front was completely changed in December, 2005, and the remote control entry system was equipped normally. It suits the standard.